In his senior year, Quinten Rollins averaged 6.9 points per game, 3.9 rebounds per, and 3.9 assists per…wait. My bad. Wrong sport. After running point guard for the Redhawks for four years, and finishing as one of the MAC’s all-time greats, Quinten Rollins shifted his focus to football with one year of eligibility left. He is known for his defensive prowess on the hardwood, and that’s the mentality he carried to the gridiron playing cornerback. In high school, Rollins played running back, wide receiver, and was a freelancing safety on defense. After the four year break from the game to play basketball, Rollins wowed the coaches through the spring, summer, and into the season as he climbed the depth chart, and turned into the MAC defensive player of the year. He earned such an honor by posting 72 tackles, 16 passes defensed, and seven interceptions. In an interview with CBS Sports draft expert, Dane Brugler, Rollins addressed what it was like to win the MAC Defensive POY Award. An assist man in basketball, defensive mindset, puts team awards ahead of individual accolades in a heartbeat. That spells team player, and a guy I’d want on my team. He’s got the maturity and right mindset to play at the next level. Let’s go to the tape and see how Quinten Rollins measures up, specifically against conference rival, Ohio. Pick 6. Rollins practically ran the route for the receiver. Great job of reading the QB and jumping the route. Also, how many times do we see a guy who gets a gift from the QB like this and then bobbles the ball and drops it? Too many. Hangs on, and finishes the play with some shiftiness. Again, the hands, keeps his team ahead by two scores. Great way to respond after allowing a 39 yard gain on a deep ball two plays prior. There isn’t much tape of Rollins getting thrown to. Which is good, because it means most time he is doing his job blanketing his man. But a glaring red flag, is his ability to defend the deep ball. Take a look. Lack of speed shows up here as he gets beat on the long ball. Tight coverage by Rollins off the line, but couldn’t make up the distance given up after getting beat, and a little hand fighting really slowed him down, giving the receiver plenty of space. Trying to play catch-up again, and this time Rollins commits pass interference in order to keep the receiver from going the distance. 15 yards versus a possible TD in college, worth taking the flag. But not what you want to see in the NFL. Summary: Quinten Rollins is a great story. Basketball player who makes football look easy with award winning play after taking four years off from the game. He does some things very well, but I don’t see him as NFL ready quite yet, and would put him closer to the third round grade the guys at Walter Football give (3-5 round to be exact), rather than the 1-2 round grade the crew at CBS sports gives him. He’ll need to improve his speed at the next level to keep up with quicker players. 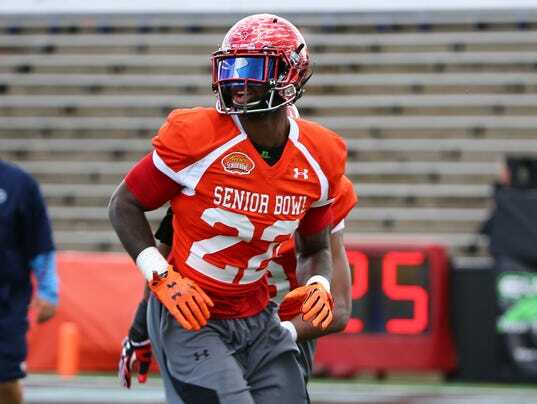 However, at the Senior Bowl, he made scouts take notice with an INT on a deep ball. He was in off-man coverage, and the problems in the clips above came from press-man. As if he doesn’t have the closing speed if he gets beat off the line. Rollins needs to bulk up a bit in order to be a factor in run stopping, and tackling. Too often he tries to throw a low shoulder into a runner, or wraps up too high on a guy. NFL players will escapes those all day. It’s too bad we didn’t get to see him line up with Devin Funchess when Rollins and the Redhawks traveled to Michigan. Would have gotten to see him against and NFL caliber receiver with size, rather than the MAC guys who will go on to do…something else on Sundays in the future.